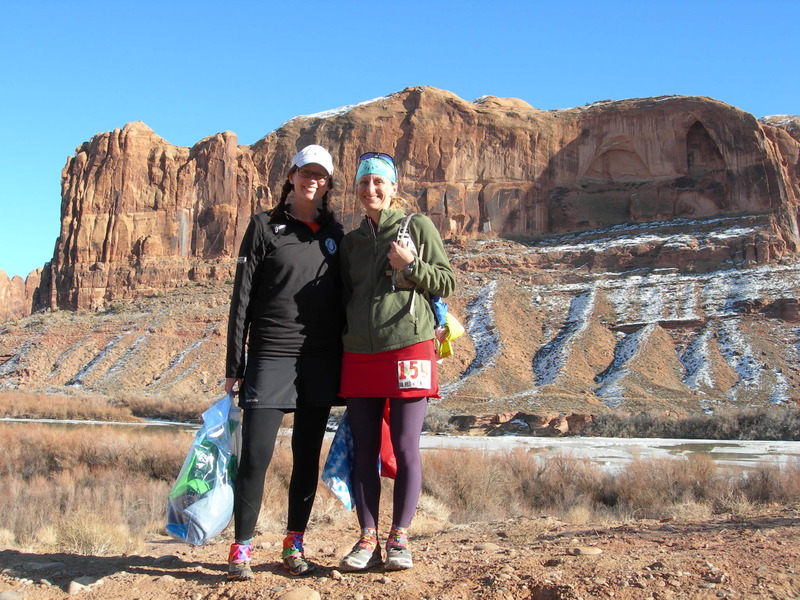 I signed up for the Moab Red Hot 55k back in September after Davina asked me if I wanted to go on a running road trip with her. I gotta admit, I was a bit reluctant to make a 9 hour drive ‘just’ to do a 50k. But I wanted to support Davina in doing a run that interested her, and honestly, the run really did look pretty cool. Or Hot, as it were. Through a variety of circumstances that led me to believe I might be on my own to make the trip, I had to consider whether I wanted to do the run regardless of Davina or not. Through encouragement of my ever-supportive husband and some soul-searching, I decided I was excited about the run regardless of who I would end up traveling with; and besides all that, it fell in perfect timing as a training race for the upcoming Antelope Island Buffalo Run in five weeks. Anyway, long story short, Davina did decide to start the race despite not being certain that a finish was distinctly probable. Not only that, she decided not to drop down to the 33k, but instead chose to tackle the 55k and do her best to make the four and a half hour cutoff at mile 17. 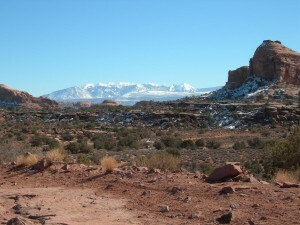 We drove from Nampa to Moab on Friday and started getting excited when we began to see the red dirt terrain of southern Utah. Never having been to this type of country before, we were in for a treat. Not only was the terrain looking amazing, the weather forecast was 100% perfecto for running. We hit the packet pickup late Friday afternoon at a restaurant in Moab. With ~800 runners signed up, we expected a chaotic and crowded scene, but experienced exactly the opposite. We were the only ones picking up our packets at that moment, and the process was organized and efficient, run by an ample crew of outdoorsy and fit looking people. I expected a little more schwag from a race with a hefty entry fee ($83 early/$95 late) and major sponsors, but we got the standard tech tee in a La Sportiva Mountain Cup cinch sak with a Hammer Gel and the usual assortment of race advertisements, and that was fine. I figured our entry fees went toward the massive shuttle system required to accommodate parking for such a large crowd because they definitely did not go toward the finish line food, extra schwag, or finisher awards. We had been told that sponsors had provided a lot of raffle items, but that process required 1. That you could remember/find your raffle ticket after the race, and 2. That you would stick around for hours and hours waiting as they would call small groups of numbers periodically from noon throughout the afternoon, neither of which we could or wanted to do. Race morning, we parked at the Gemini Bridges Road intersection with the highway and then walked the ¾ mile up to the start area. When we had scoped out the start location Friday night, I was alarmed at the SIX portapotties that would need to accommodate nearly 800 runners. So, it was the BEST surprise that when we arrived at the start area right at 7:15 am, there was…wait for it…NO LINE. Pre-race with no portapotty line just rocks. I did notice that the lines by 7:45 am were pretty long, though. The race-morning packet pickup seemed to be going efficiently, and we checked in with the lady in the orange vest to let her know we were there to start. I appreciated the ample supply of water and piles of Heed FIZZ tablets available to runners at the start. Davina and I each drank a cup of FIZZ while we were waiting around. We had arrived right at 7:15 for the pre-race briefing that had been advertised to take place at that time, but that ended up not really being the case, as it was maybe 7:30? when race director Chris Martinez megaphoned a very short briefing consisting of course markings to follow and a near-bewilderment at the stellar and dry condition of the course. The morning was cold, in the 20s, but we knew it would warm up at least into the mid-40s (I think it hit 47), so we dressed in layers. Still, I couldn’t believe all the skinny little people trotting around in shorts and singlets. 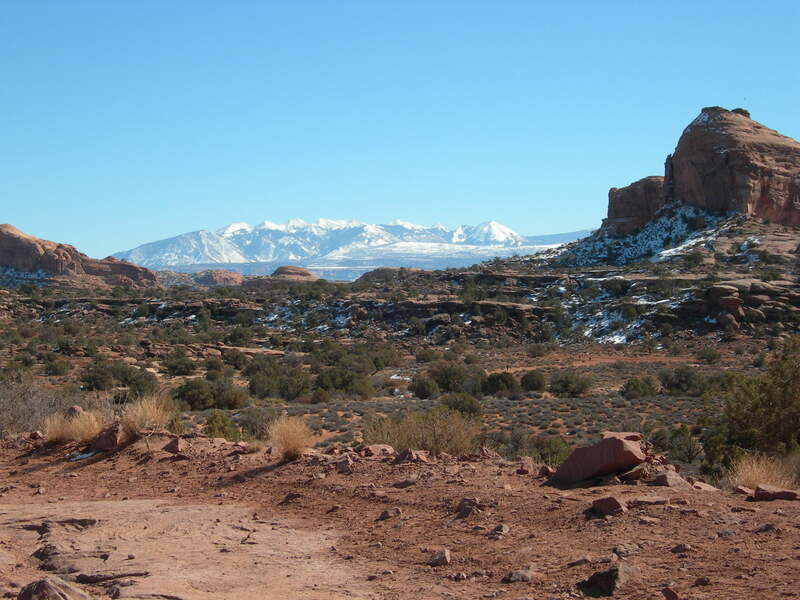 Mountains and red rock in the same view! We knew about 800 runners had signed up, but it sure didn’t seem like it. The start had a very low-key, draw the start line with your toe in the dirt, sort of feeling, even as Dakota Jones drove his little red truck right through the start line throng to his special up-front parking spot about 15 minutes before the start. Supposedly, a bunch of other elites were there, but I didn’t recognize anyone, not that I was really looking. At the last minute, we stripped off our sweats and put them in drop bags for the finish. Darian spotted us about 30 seconds before the call of GO and quickly gave hugs and snapped a picture of us. Unfortunately, we didn’t see him again after that, but it was a nice boost to see him for that moment. He ran the 33k and we were sure he had finished and departed long before we got to the finish. We started way in the back of the pack, nice and easy. I turned to Davina and told her to have fun and have a good run. It was the last time I saw her until the finish, and I left her wondering if she would be there when I finished or not. “There” would mean she had not made the cutoff, and “not” would mean she was still out racing. I hoped I would be the one waiting for her. Soon we started up the first little climb (about a mile) up and around the side of the mesa that would take us into the backcountry and the famed Moab trails. The north facing slope of the first road was slick with snow and some ice, but other than that and one other little stretch on wind-swept Metal Masher, that was the extent of ‘conditions’ for the entire course. A runner could not even ask for a more perfect day for a run – dry trails, not too cold/not too hot temps, sunshine, gorgeous scenery…the Red Hot 55k on this day had it all. I covered the first 6 miles to Aid Station 1 in 58 minutes, which I was super happy about. It was good running, with just two little hills to get us warmed up for what was to come. Not having run this race before, and not having a Garmin to give me heads up regarding impending aid stations, the surprise of the first aid station was fun because I didn’t think I would get there so fast, and the surprises just kept coming all day long. There wasn’t one aid station I was having a meltdown over wishing it would come sooner. Grabbing a handful of chips, a mini Almond Joy (which remained uneaten), a quarter of pb&j, and a couple cups of cola, I quickly exited Aid 1 in about 30 seconds, eating and drinking as I walked up the little hill out of the aid station. Soon we made a right turn onto the loop we would complete before returning to that first aid station which doubled as Aid 3. The section between Aid 1 and Aid 2 was one of the neatest parts of the course. We climbed up the Metal Masher trail and got to experience the slickrock for the first time. I caught whiffs of juniper and was enjoying my surroundings so much. We reached the top of the rim and could look down and see the start area we’d left a couple hours before. 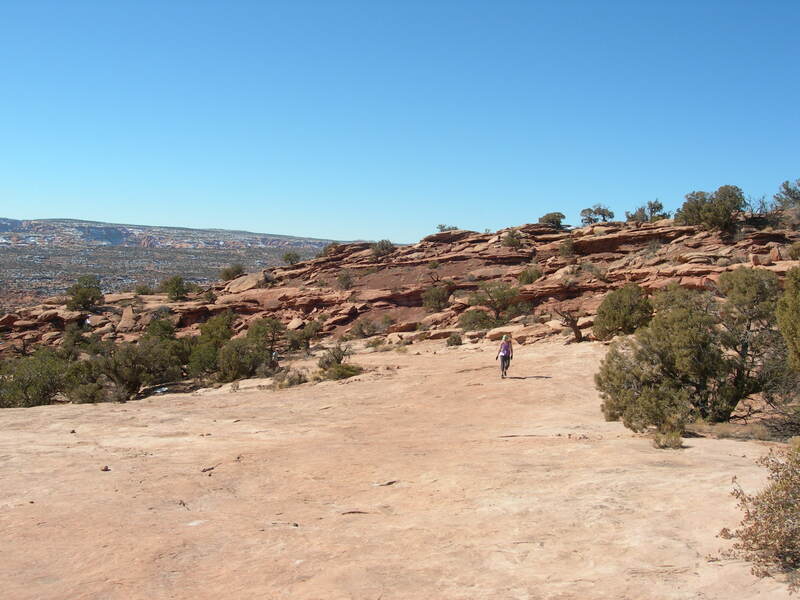 The trail was very technical and rocky, requiring a lot of paying attention, but the red dirt was a dream to run on (soft and cushiony when it wasn’t rocky), and the type of terrain was all new to me anyway, so I didn’t mind any of it. In addition to that, I was appreciating the way I was feeling – not super fresh or springy, but still having good energy and the spirit to work hard. At least I didn’t have leaded legs. I pushed up all of the climbing, running everything except the more extended and steep climbs, and ran quick and easy on everything else. I felt really good through this section. Arriving at Aid 2 (13 miles) in 2:28, I was stoked. Again, coming upon the aid station was a surprise, and I grabbed another couple cups of coke and some chips and walked on through. The trail monitor sitting at the junction a couple hundred yards up the trail said the best part was yet to come on the Gold Bar and Golden Spike trails between Aids 3 and 5. But I had to get through the next 4 innocuous and less-interesting miles to Aid 3 and the cutoff first. I had to walk a bit after this to get myself situated for the rest of the day by taking my top shirt layer off and putting my hat and gloves in my pack. 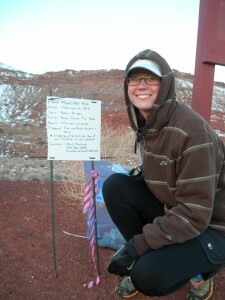 I also took the opportunity to make a quick call to John and give him a report of my first two aid station splits. I knew Amy back home might be interested, and it was motivating me to know that people might like the updates, even just from a 50k. But then, all organized and ready to go, I kicked it into gear and ran strong on the lightly rolling dirt road miles to the next aid station, checking into Aid 3 (mile 17) at 3:20. The typical pain in my hips and hammimes had set in by this point, but I went all “AK” (Amy King) on it, and just kept running and tried to make it look good even though it hurt like running around Lake Lowell. My arrival at Aid 3 was particularly uplifting because I had definitively made the cutoff (4:30) and didn’t have to worry about that anymore. However, I was aware of my tendency to not push without the necessity to do so, and I vowed that I would not fall into that trap today. I thought about my parents, always supportive, and my dad undergoing a stem cell transplant at the VA in Seattle. I thought about Davina back there on the trail, hoping she was having a good day and overcoming. I thought about my training partners Sam and Amy, who I figured were running together without me. I thought about my friend Amber who had to give up coming with us to Moab to rest her injured ankle so she can run Antelope Island. And I thought about my ever-loving hubby who gives me so much love and support, so much more than I deserve. And all of this thinking kept me running – out of respect for those who can’t; out of love for those who support. And then the “big” climb of the day came. From about mile 19-22, we climbed vast sheets of slickrock, some of it requiring hands to brace, some of it in step form, but all of it technical and beautiful. The thing about slickrock it this: in pictures, you see people running across it, and it looks like it will be all nice and smooth and lalala. This is not the case. Slickrock can be smooth and nice running, but only in very short sections at a time. The rest of the time, you are stepping up onto it, stepping off of it, tripping on the grooves, leaping over crevasses, navigating the 45 degree angles of the surface, and always watching your footing because it’s very much not smooth – more like a dimpled, bumpy roller coaster for your feet, a very challenging terrain for someone with ‘iffy’ ankles like myself. Anyway, I was rocking the climb, and no one passed me going uphill. I was leapfrogging with a few people who were better technical downhill and flat runners, but I caught and passed them all on this climb. I don’t know how this was even happening with my lack of hill and trail running in the recent winter months, but it was, and I was grateful for the gift. Come to think of it, I will attribute my strength to the CrossFit I’ve been doing 2-3 times per week. At the race high point. I reached the high point of the course at mile 21 (or 22?) at Aid 4 with a time of 4:30 on the race clock. This aid station had been driven in by very kind and brave people in Jeeps and sat perched on the side of the massive hill overlooking the valley of high desert shrubbery and rock formations. The day was perfect but felt quite warm compared to the cold temps we have been used to running in, and I knew it would be a pretty long stretch to the next aid, so I decided to fill up with water one time for the day at this aid station. Between that and taking a couple of pictures at the summit, I was there about 5 minutes, which was time well spent. After facebooking the picture a runner took of me on the rim (I know that’s obnoxious, don’t judge) and texting John my last two splits off my trusty old Timex Ironman, I got down to the business of tackling the non-straightforward, EKG-shaped descent on the Golden Spike trail into the next aid station. This was by far the most difficult portion of the race. The entire seven miles was composed of angled slickrock face, slickrock ‘steps’, striated and broken rock, and large rock drop-offs and caverns to traverse. I just did the best I could. It was hard to get a rhythm going with the technicality and constantly changing demeanor of the rock. Some of it was friendly; some of it clearly hated human beings, runners in particular. I was leapfrogging with a girl who was clearly struggling mentally, and I found myself drawing strength from that, knowing that I was doing good with running in the moment and not being frustrated with a long aid to aid section. The piece from 21 to 28 miles took 1:44, and I arrived at Aid 5 at 6:14, downing two cups of cola (open note to all race directors: serve name-brand soda!!) and a cup of Heed, which would be all I’d need to get me to the finish. Considering the advisement of a veteran Red Hot runner I’d talked with a few times throughout the day, I judged that I would have a chance at doing the last 5-6 miles (no one seems to be able to say if the course is 33 or 34 miles), in an hour and ten minutes or less, so I set my sights on a sub-7:30 and focused on not letting up on the intensity. I ran 95% of the last portion of the race, only taking one walk break on a very monotonous flat road section and then sort of walk-fast stepping through another incredibly beautiful but treacherous big-rock drainage. We slid on our butts down a 5-foot slickrock dropoff to the amusement of some course “monitors” and said goodbye to the big expanses of rock for the day. After this, we had just two miles left of the mondo-rocky Poison Spider trail to take us down into the river gorge and the finish. Climbing to Mile 21 aid station. I had been running strong since Aid 5, but I really resolved to run my heart out the last two miles unlike the many people I passed those last miles who were just walking it in. I had a race to finish, and I wanted to make myself and my friends proud! I hurtled dangerously over the rolley rocks down the grandiose mile and a half into the river gorge, hoping and praying I would not crash at this late hour. Again, no one passed me on this section, and I re-passed a guy who had caught me on the last downhill slickrock, leaving me to finish in focused silence. The switchback road leading down into the gorge was rocky but very runnable for someone who is nimble and paying attention. I don’t know if I fell into the ‘nimbe’ category, but I was paying attention, and I could “smell” the finish, so I ran as hard as I could down, down, down, and finally came to a couple sitting on a high rock who advised me the finish was right around the next corner! I couldn’t believe I couldn’t see it from way back at the top of the bluff. I rounded the corner to the finish and there was just a mashup of people and tents and it was all a blur except for the very sharp focus I was giving to the rocks underfoot. I did not want to crash so close to the finish line with all these people watching. And then I heard it. Davina’s voice. Go EM! My spirit sagged a little bit, knowing her race ended early. But she met me at the finish, and I hugged her and said I’m sorry, and she said she had a great day and was happy and had no regrets. 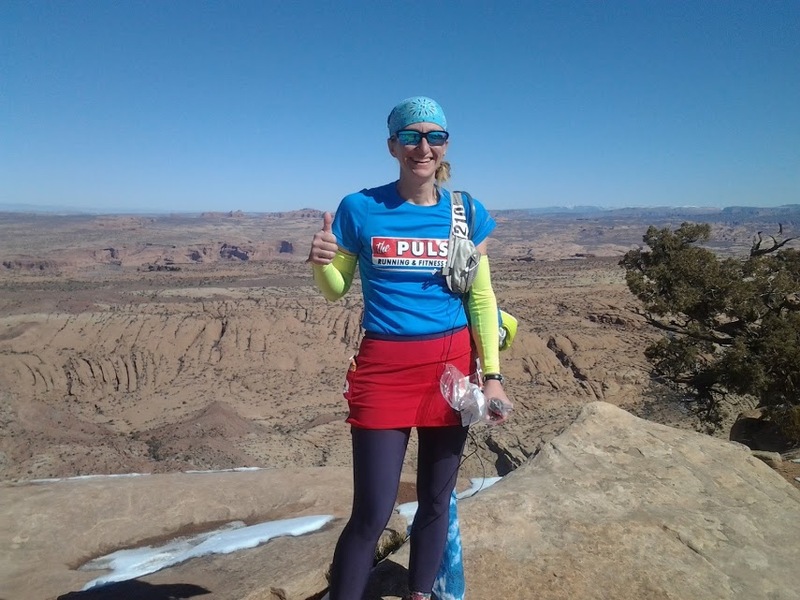 For me, my ankles held up, my mind held up, and I finished the Moab Red Hot 55k in 7:20, in what was one of my best executed races and definitely my best 50k. I wanted to hear all about Davina’s race; but first I ran into Ninja Turtle Eric Lee who I first met at the IMTUF 100 in October, and then I had to greet a couple of ‘trail friends’ who were finishing behind me, and then we headed over for the butternut apple bisque soup that was being served to runners (it actually tasted really good), and we had a nice chat with some friends Davina had met at the Salt Flats 100 last April. The finish area is staged on a ledge just above the highway at the bottom of the Colorado River gorge. It’s really a neat setting with good atmosphere, complete with raffle prizes, music playing, food vendors for spectators, a beer garden, a massage guy, and lots of sponsor booths. It might have been nice to hang out in the sun for a while and watch people finish and listen for our raffle numbers, but we were ready to drive up to Ogden for the night so we wouldn’t have to do the whole drive on Sunday. We caught the shuttle that took us back to our car at the parking area 3 ¾ miles away from the finish and then hit the road. 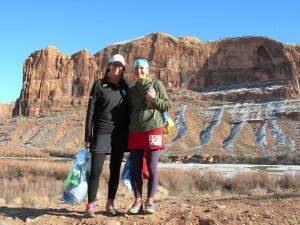 Our trip to Moab was a quick trip with a long drive; a fun weekend full of good friend time and superb trail running. 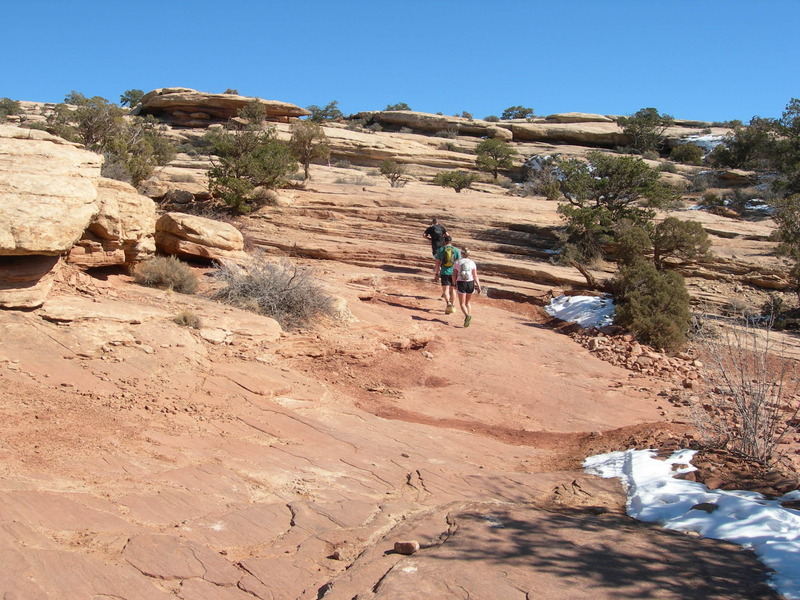 The Red Hot 55k is a low-key race where the course is the star. If you’re looking for an early-season race with a healthy challenge and good organization, you should sign yourself up next year. Stayed in the game; didn’t get impatient; didn’t wish for the aid stations to come sooner. Focused on running every part I could and power hiking everything else (and I mean power hiking – no one passed me on a climb the whole day, but I sure caught a whole bunch of people that way). Fueled to the needs of the day – my stomach was feeling ‘borderline,’ so I kept the intake to mostly pop and some shot blocks after the halfway point, but still, I didn’t let myself get too depleted. Never allowed myself to have a ‘slog’ section. If I could run, I was running, even if it was slow. This goes very closely hand in hand with the fueling piece – you have to fuel adequately to avoid the bonk. Looked around and appreciated my surroundings at all times, adding maybe 10 minutes to my overall time taking some pictures and having people take a few pics of me. It was worth it for this sort of infrequent opportunity to visit someplace so heavenly. I didn’t see you out there but I’m glad you had a great day. It sure was pretty down there this weekend. See you at Buffalo! Hi Emily. Saw your name on a news alert and I’m wondering where you fit into the Berriochoa family. My newest daughter in law is also an Emily.